Objective To compare the effectiveness of social behaviour and network therapy, a new treatment for alcohol problems, with that of the proved motivational enhancement therapy. Setting Seven treatment sites around Birmingham, Cardiff, and Leeds. Participants 742 clients with alcohol problems; 689 (93.0%) were interviewed at three months and 617 (83.2%) at 12 months. Interventions Social behaviour and network therapy and motivational enhancement therapy. Main outcome measures Changes in alcohol consumption, alcohol dependence, and alcohol related problems over 12 months. Results Both groups reported substantial reductions in alcohol consumption, dependence, and problems, and better mental health related quality of life over 12 months. Between groups we found only one significant difference in outcome, probably due to chance: the social network group showed significantly better physical health at three months. Non-significant differences at 12 months in the motivational group relative to the social network group included: the number of drinks consumed per drinking day had decreased by an extra 1.1 (95% confidence interval −1.0 to 3.2); scores on the Leeds dependence questionnaire had improved by an extra 0.6 (−0.7 to 2.0); scores on the alcohol problems questionnaire had improved by an extra 0.5 (−0.4 to 1.4); but the number of days abstinent from drinking had increased by 1.2% less (−4.5% to 6.9%). Conclusion The novel social behaviour and network therapy for alcohol problems did not differ significantly in effectiveness from the proved motivational enhancement therapy. Alcohol dependence and misuse are common and costly. In 2000 the estimated prevalence of alcohol dependence in the United Kingdom was 11.9% among men and 2.9% among women.1 The public costs of heavy drinking in England and Wales are about £18 000m ($32 438m; €26 424m).2 Some 300 advice and counselling services, 100 day programmes, and nearly 200 residential programmes meet the resulting demand for treatment.3 No British randomised trial of non-pharmacological treatments for alcohol problems has had the statistical power to detect even medium sized effects.4 To our knowledge only one randomised trial (the “matching alcoholism treatments to client heterogeneity” trial) of psychosocial treatments for alcohol problems has been able to detect small effects, by studying 1726 clients in nine treatment sites across the United States.5 Clients were randomly allocated to three manual based interventions, namely cognitive behavioural therapy, twelve step facilitation therapy, and motivational enhancement therapy. Cognitive behavioural therapy and twelve step facilitation therapy each comprised 12 sessions whereas the motivational enhancement therapy comprised four sessions, all over 12 weeks. Results showed substantial improvements in drinking outcomes for all three. Motivational enhancement therapy achieved outcomes essentially similar to those of the two more intensive treatments.5 6 The size of the trial meant that this was unlikely to have been a type 2 error. This evidence and the increasing popularity of motivational enhancement therapy led to the proposal that this therapy should act as standard treatment in research on the effectiveness of treatment for alcohol problems.7 Meta-analyses have since confirmed the effectiveness of such treatments.8 These arguments led us to propose—and the Medical Research Council to accept—that motivational enhancement therapy should act as reference treatment within the United Kingdom alcohol treatment trial (UKATT).9 For ethical reasons we excluded a “no treatment” control group because we did not want to deprive participants of the known benefits of treatment. To build on the US trial we exploited systematic reviews citing effective treatments that considered clients' social environment and support system.10 We designed and tested the social behaviour and network therapy specifically for our trial.11 The underlying theory is that overcoming alcohol problems needs support from family or friends. Thus we compared a novel social treatment with a strong theoretical and empirical basis with an established but briefer motivational treatment of proved effectiveness. The corresponding alternative hypotheses were both two sided. We were keen to derive recommendations for clinical practice from the trial. With little research in this field we were open to recommend either therapy as the treatment of choice. If the therapies were similar in effectiveness and cost effectiveness, we were open to recommend that choice should depend on other factors, perhaps local. The sites nominated 76 candidates to train as therapists for the trial. To demonstrate suitability for training, the candidates submitted separate video recordings showing motivational skills and ability to work with clients' family and friends. We randomly assigned roughly twice as many therapists to the social behaviour and network therapy as to motivational enhancement therapy because social therapy takes about twice as much therapist time as motivational therapy. We trained 72 of the candidates in their allocated treatments through courses at Leeds lasting three days. To achieve accreditation, the trainees had to complete the supervised treatment of one or two clients and show competence through video recordings. The 52 therapists who achieved this continued to record treatment sessions on video and to receive supervision to encourage compliance with their allocated manual. Social behaviour and network therapy comprises cognitive and behavioural strategies to help clients build social networks supportive of change.11 In our trial the therapy comprised eight 50 minute sessions over eight to 12 weeks. In our trial, motivational enhancement therapy comprised three 50 minute sessions over eight to 12 weeks.9 It combined counselling in the motivational style13 with objective feedback.14 The therapy showed two main changes from the version used in the US study,14 both designed to keep it distinct from social behaviour and network therapy while retaining the features that led to the proposal that it act as standard treatment in research on treatment for alcohol problems.7 8 Firstly, we offered three sessions rather than four. Secondly, we allowed “significant others” to attend only the first session and to provide only confirmatory information. We sought to include clients who would normally receive an offer of treatment from British treatment sites for alcohol problems.9 We excluded people aged under 16; people who were illiterate, could not name a contact, or intended to leave the area; people with uncontrolled psychotic illness or severe cognitive impairment; people for whom alcohol was not the main problem; and people who were receiving treatment for an alcohol problem. Researchers interviewed participants at home three and 12 months after entry to the trial, regardless of whether treatment was completed.9 Both schedules were similar to those completed before treatment. At 12 months we employed a new team of interviewers to ensure that they were blind to treatment allocation. We did not have the resources to do this at three months. Primary outcome measures were9 alcohol consumption, derived from form 9015 and summarised by number of drinks (that is, units of alcohol, equivalent to 8 g of ethanol) per drinking day and percentage of days abstinent5; alcohol dependence, measured by the Leeds dependence questionnaire16; alcohol related problems over the past three months, measured by the alcohol problems questionnaire17; and γ-glutamyl transferase, a liver function test measured by the Reflotron18—although this test is better used to monitor change after an abnormal score, it reputedly corroborates reported alcohol consumption. Secondary outcome measures were associated with health related quality of life9: the EQ-5D, a commonly used health status index19; the SF-36, a commonly used health profile20; and the general health questionnaire 28,21 commonly used to measure psychological disturbance. We aimed to recruit 720 clients at seven sites.9 We sought to interview 80% of these after 12 months. Allowing for correlation within sites and for the minor imbalance in the number of clients allocated to each therapy resulting from the corresponding imbalance in the numbers of therapists, our trial had at least 80% power using a 5% significance level to detect a standardised difference, either positive or negative, of less than one quarter (usually regarded as a small effect) between the therapies. In accordance with our prespecified analysis plan we used analysis of covariance to take account of site (prestratification factor), use of detoxification, and drinking goal as reported at randomisation (poststratification factors) and to adjust for differences between groups in scores before randomisation. We analysed data by intention to treat. To assess whether attrition affected findings we undertook sensitivity analysis using the last recorded response from each respondent (last observation carried forward). Between 1999 and 2001 we recruited 742 participants with alcohol problems (figure) from clients of all ages above 16 and all social groups (table 1). Although only 211 (28.4%) received detoxification between screening and recruitment (table 1), others had done so before screening, when levels of dependency were probably higher. We interviewed 689 (93.0%) participants at three months and 617 (83.2%) at 12 months (table 2). Of 125 participants lost to follow-up at 12 months, 12 had died, 35 did not respond, and 78 could not be traced or contacted. Analysis of covariance showed that the therapy groups achieved similar outcomes at three and 12 months (table 3). As attrition was only 7% at three months and 17% at 12 months, sensitivity analysis using the last observation carried forward generated similar findings. The only significant difference we found was that after three months the adjusted mean physical component score of the SF-36 for clients in the social network group exceeded that of the clients in the motivational group by 1.31 (95% confidence interval 0.05 to 2.57). As both mean scores were close to those at baseline (table 2), and because we invoked 18 distinct significance tests (table 3), it would be prudent to regard this as a possible random consequence of multiple comparisons. To explore these findings further, we compared the mean adjusted scores at baseline and after three and 12 months for all who responded (table 2). At three months we found highly significant improvements in all patient outcomes except the EQ-5D and log γ-glutamyl transferase. Baseline correlations between log γ-glutamyl transferase and patient assessed outcomes were, however, all 0.3 or less. The adjusted proportion of days on which clients reported that they had abstained improved from 29% to 43% at three months and to 46% at 12 months. Mean adjusted alcohol consumption reported by continuing drinkers fell from 27 drinks per drinking day to 18 at three months and to 19 at 12 months. Reported mean adjusted scores on the Leeds dependence questionnaire fell from 17 to 12 at three months and to 11 at 12 months. Reported mean adjusted scores on the alcohol problem questionnaire fell from 12 to 7 at three months and to 6 at 12 months. Reported mental health also improved: the mean adjusted score of the mental component of the SF-36 rose from 30 to 37 at three months and to 39 at 12 months. We found no serious adverse events. Social behaviour and network therapy (a novel social treatment for alcohol problems) and motivational enhancement therapy (a motivational treatment of proved effectiveness), led to similar improvements in reported alcohol consumption, dependence, and problems, and in mental health, all of which were maintained over 12 months. Clients in both groups reported that total alcohol consumption had decreased by 48% at three months and by 45% at 12 months and that alcohol related problems had decreased by 44% at three months and by 50% at 12 months. By recruiting more than 700 participants, our trial had power to detect small differences. Our trial was pragmatic in that it compared the effectiveness of treatments under routine conditions rather than their efficacy under controlled conditions. 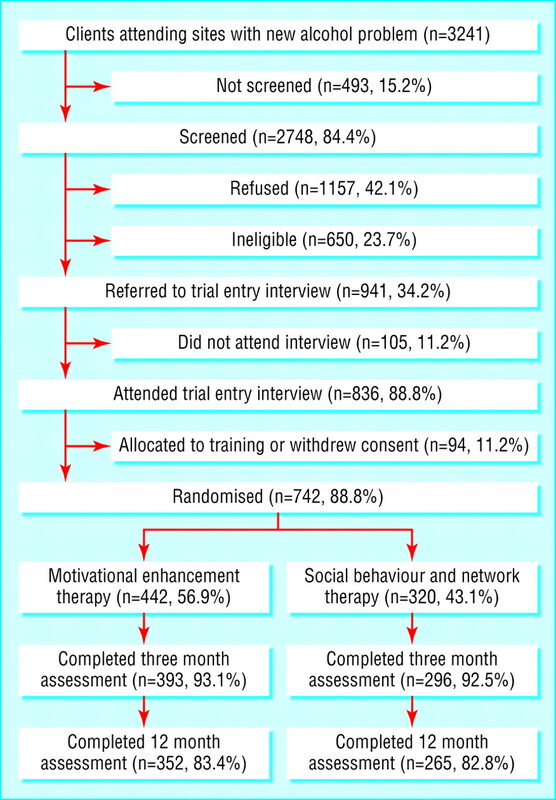 Internal validity was protected, notably by randomising therapists between therapies, randomising clients remotely, and keeping interviewers blind to treatment at 12 months.9 Since we treated motivational enhancement therapy as a reference treatment of proved effectiveness, we infer that social behaviour and network therapy is equally effective. We can identify two main reasons why we found little difference between the therapies. Firstly, the evidence for the validity of self reports22 23 and the evidence from outside our trial for the effectiveness of motivational enhancement therapy6–8 24 25 strongly suggest that both therapies are effective. Secondly, both therapies add three common elements to the treatment process: a structured, published manual based on available scientific evidence; training of therapists at the Leeds Addiction Unit in a professional and rigorous atmosphere; and regular supervision of the therapists by separate teachers with considerable experience of treatment for alcohol problems. Hence therapists expected both therapies to yield good results. In a separate economic paper we investigate the cost effectiveness of the therapies.12 Both social behaviour and network therapy and motivational enhancement therapy proved acceptable to clients, managers, and more than 50 therapists allocated between them at random. More importantly, our participants reported that the therapies were equally effective in reducing drinking and associated problems and in improving mental health. We thank the participants for their contributions. The Medical Research Council established a trial steering committee to monitor the progress of the trial. Contributors AC was responsible for research and clinical management in the West Midlands. He contributed to the original grant application, the design, implementation, and management of the trial, analysing and interpreting data, and writing the paper. SC was responsible for designing and implementing the data management plan, and scanning, verifying, and validating data. He contributed to implementing the trial design, developing and implementing randomisation procedures, developing questionnaires and data collection instruments, analysing and interpreting data, and redrafting the paper. AF was responsible for designing and implementing the analysis plan, and validating data statistically. She contributed to implementing the trial design, developing and implementing randomisation procedures, developing data collection instruments, analysing and interpreting data, and redrafting the paper. CG was responsible for health economics. She contributed to the original grant application, the design, management, and implementation of the trial, analysing and interpreting data, and writing the paper. NH was responsible for research coordination. He contributed to the original grant application and participated in the design, implementation, and management of the trial, managing, analysing, and interpreting data, and writing the paper. RH was responsible for research and clinical management in South Wales. He contributed to the original grant application, the design, implementation and management of the trial, analysing and interpreting data, and writing the paper. VM contributed to validating, analysing, and interpreting data, and writing the paper. JO was responsible for trial coordination. He contributed to the original grant application, the design, implementation, and management of the trial, managing, analysing, and interpreting data, and writing the paper. SP was responsible for designing and implementing the health economic assessment. He contributed to implementing the trial design, developing procedures, questionnaires, and other instruments, analysing and interpreting data, and writing the paper. DR was responsible for research and clinical management in Leeds. He contributed to the original grant application, the design, implementation and management of the trial, analysing and interpreting data, and writing the paper. IR was responsible for trial methods. He contributed to the original grant application, the design, implementation, and management of the trial, managing, analysing, and interpreting data, and writing the paper. DR and IR act as guarantors. GS was responsible for designing and implementing trial management and quality assurance procedures, and coordinating the work of the treatment sites. He contributed to the implementation and management of the trial, developing procedures, questionnaires, and other instruments, designing and implementing the data management plan, verifying, validating, analysing, and interpreting data, and redrafting the paper. G Tober was responsible for therapist training and supervision. She contributed to the original grant application, the design, implementation, and management of the trial, the management and analysis of video recordings of therapy within the trial, analysing and interpreting data, and writing the paper. The local research coordinators responsible for implementing and managing the trial were: G Thistlethwaite in the integrated treatment site in Leeds; TA across four treatment sites in South Wales; and CK across two treatment sites in the West Midlands. The main follow-up interviewers were: LH and AW in Leeds; RB and BJ in South Wales; and KF and MS in the West Midlands. RB and BJ later became local research coordinators in succession to TA, and MS in succession to CK. At the trial training centre in Leeds, OF and WM analysed the video recordings of therapy. These fieldworkers also contributed to developing procedures, questionnaires, and other instruments. Together with other authors they commented on successive drafts of the paper. Funding Medical Research Council, NHS Executive in England, Wales Office for Research and Development in Health and Social Care, and the Alcohol and Education Research Council. Ethical approval All relevant local research ethics committees. See web extra for full authorship details.
. Psychiatric morbidity among adults living in private households in 2000. London: Stationery Office, 2001.
. Alcohol misuse: how much does it cost? London: Cabinet Office, 2003. http://www.strategy.gov.uk/downloads/files/econ.pdf (acccessed 25 April 2005).
. Report on the mapping of alcohol services in England. London: Alcohol Concern, 2002.
. Advice versus extended treatment for alcoholism: controlled study. Br J Addict 1988; 83: 15970.
. Matching alcoholism treatments to client heterogeneity: project MATCH post-treatment drinking outcomes. J Stud Alcohol 1997; 58: 729.
. Matching alcoholism treatments to client heterogeneity: project MATCH three-year drinking outcomes. Alcoh: Clin Exp Res 1998; 22: 130011.
. Limitations in using existing alcohol treatment trials to develop practice guidelines. Addiction 2000; 95: 1491500.
. The efficacy of motivational interviewing: a metaanalysis of controlled clinical trials. J Consult Clin Psychol 2003; 71: 84361.
. United Kingdom alcohol treatment trial (UKATT): hypotheses, design and methods. Alcohol Alcohol 2001; 36: 1121.
. A wealth of alternatives: effective treatments for alcohol problems. In: Miller WR, Heather N, eds. Treating addictive behaviors. 2nd ed. New York: Plenum, 1998: 20316.
. Social behaviour and network therapy: basic principles and early experiences. Addict Behav 2002; 27: 34566.
. Cost effectiveness of treatment for alcohol problems: findings of the randomised UK alcohol treatment trial (UKATT). BMJ 2005; 331: 5448.
. Motivational interviewing: preparing people for change. 2nd ed. New York: Guilford Press, 2002.
. Motivational enhancement therapy: a clinical research guide for therapists treating individuals with alcohol abuse and dependence. Project MATCH monograph 2. DHHS Publication No (ADM) 92–1894. Washington, DC: Department of Health and Human Services, 1992.
. Form 90: a structured assessment interview for drinking and related behaviors. Project MATCH monograph 5. Rockville, MD: National Institute on Alcohol Abuse and Alcoholism, 1996.
. Development of the Leeds dependence questionnaire (LDQ) to measure alcohol and opiate dependence in the context of a treatment evaluation package. Addiction 1994; 89: 56372.
. The relationship between alcohol dependence and alcohol related problems in a clinical population. Br J Addict 1990; 85: 35766.
. Reflotron client management system: accuracy and precision data. Indianapolis: Boehringer Mannheim, 1989.
. EuroQol: the current state of play. Health Policy 1996; 37: 5372.
. The MOS 36-item short-form health survey (SF-36): I—conceptual framework and item selection. Med Care 1992; 30: 47383.
. The detection of psychiatric illness by questionnaire. Oxford: Oxford University Press, 1972.
. Limitations in the use of gamma-glutamyl transferase estimations in alcohol dependent subjects. Alcohol Alcohol 1998; 33: 62630.
. Talk is cheap: measuring drinking outcomes in clinical trials. J Stud Alcohol 2000; 61: 5563.
. How important is treatment? One-year outcomes of treated and untreated alcohol-dependent individuals. Addiction 2003; 98: 90111.
. A randomised controlled trial of motivational enhancement therapy (MET) for mild to moderate alcohol dependence. J Stud Alcohol 2001; 62: 38996.